Unique Stocking Stuffer Ideas or Gift Basket Add-ins | Things Engraved Inc.
Hopefully you have started your Christmas shopping already. In this post we’ve included some unique stocking stuffer idea, including ideas geared towards both women and men. Shoes is the theme for the female-geared gifts and we’ve included some of our best selling items for men’s stocking stuffer ideas. These gift ideas also make great little items that can be used in a gift basket for anyone on your list. Gift baskets are a personalized way to gather up lots of treasures for that special person, and here at Things Engraved, we’re all about the personalized touched! This year, we hope that you make it a December To Remember and we’re doing our part to help you make that happen with the following gift ideas. Available IN STORES only. Know someone who loves shoes and/or purses? We have a great array of trinket boxes including a red highheel and ivory strappy stiletto. Plus two different designs of purses featured a top an engravable trinket box. Collect and personally engrave all 6 designs. Only $12 each. Find a retail location near you. 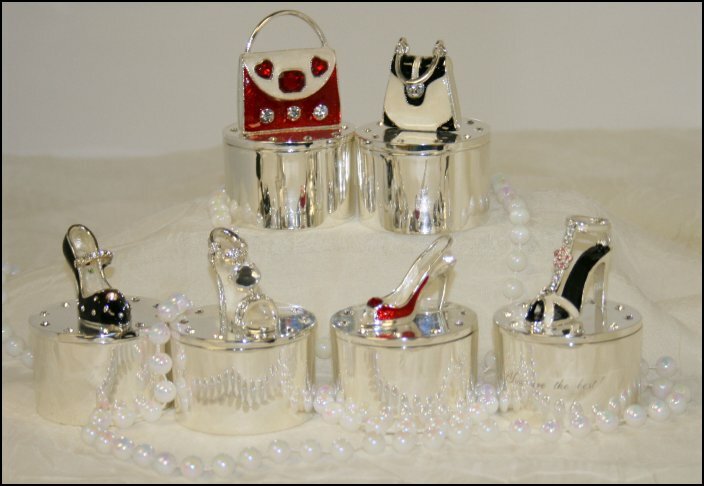 ** Click here to see an image of the whole fabulous collection of shoe purse trinket boxes. Only $6. Also for the shoe-loving woman in your life. Crack a bottle with this chrome stiletto. A trio of tiny rhinestones adorn the top of this stylish shoe. Available in-stores and online. Click to buy online. A great stocking stuffer for only $3. Keeping with our shoe theme, how about these cute luggage tags? A great stocking stuffer or gift basket filler for any avid traveller. Available in stores or click to buy. Lots of space to engrave. Good stuff for a stocking: a key chain that doubles as a bottle opener. Perfecto for $5! How will you engrave it? Order online. Not just your regular shot glass! Why? Because you’re going to etch his name right into the glass. This makes an impressive stocking stuffer or, better yet, buy a set of 4 to start your own themed gift basket. Add in a cocktail recipe book and bam, you’ve got yourself a great gift! Start here by ordering the shot glasses. Includes 1 name engraved for free! One of our most popular items for guys and ideal for his stocking. This dual dog tag necklace is made from stainless steel, it features two large engravable dog tags and comes with a 24″ ball chain. Order online now. NEW ITEM! Curvry Cross Necklace A stunning cross charm sits atop an oval shaped pendant that has plenty of room for engraving a special quote or message. This is a stylish and inspirational piece of jewellery that makes a unique stocking stuffer. Find in store, or order online. See other engravable necklace options. How are you filling your Christmas stockings this year? Share with us on Facebook!